The struggling retail giant recently used profits from American consumers to fund the annual banquet of a group closely linked to Hamas. 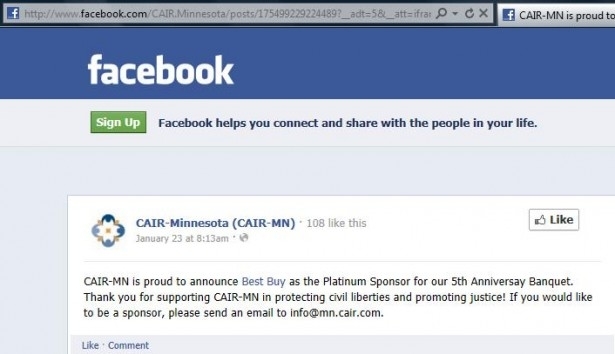 The Minnesota chapter of the Council on American-Islamic Relations (CAIR) recently listed Best Buy as a "Platinum Sponsor." Best Buy has refused to rule out future support for CAIR through numerous messages to its public relations department. The big box retailer is already in chaos amid the recent resignation of its CEO for personal misconduct, dwindling sales and bond downgrades. The United States government named CAIR an "unindicted co-conspirator" to fund the terrorist group Hamas in America's most significant terror financing trial. The U.S. also identified CAIR as an agent of the Muslim Brotherhood, and its immediate predecessor as sharing the common goal of dismantling American institutions and turning the U.S. into a Sharia-compliant, Islamic state through incremental, stealth jihad. And that's only the beginning. For all the details and links, see the bullet points below -- after the jump at the bottom of the post. Tell your friends and family about Best Buy and about Islamist Watch. If they join our mailing list (link at top of Islamist-Watch.org), they'll receive future action alerts and can help make a difference. CAIR was named an "unindicted co-conspirator" to fund the terrorist group Hamas in America's most significant terror financing trial that resulted in 108 guilty verdicts. Also, see here. The United States Government named CAIR as "individuals/entities who are and/or were members of the US Muslim Brotherhood's Palestine Committee and/or its organizations." In the course of the terror financing trial, a document emerged from the Muslim Brotherhood listing CAIR's immediate predecessor, the Islamic Association for Palestine, as one of the Brotherhood's like-minded "organizations of our friends" sharing the common goal of dismantling American institutions and turning the U.S. into a Muslim nation through stealth jihad. The FBI has "suspended all formal contacts between CAIR and the FBI," and the FBI does "not view CAIR as an appropriate liaison partner." CAIR co-founder and long-time board member Omar Ahmad once told an enthusiastic crowd: "Islam isn't in America to be equal to any other faiths, but to become dominant. The Koran, the Muslim book of scripture, should be the highest authority in America, and Islam the only accepted religion on Earth." Current CAIR spokesman Ibrahim Hooper was quoted as saying: "I wouldn't want to create the impression that I wouldn't like the government of the United States to be Islamic sometime in the future. ... But I'm not going to do anything violent to promote that. I'm going to do it through education." Senator Charles Schumer (Democrat, New York) described CAIR in a Senate Judiciary Committee hearing as an organization "which we know has ties to terrorism." FDCH Political Transcripts, Sept. 10, 2003. CAIR's Minnesota branch hampered a federal investigation into the disappearances of dozens of Twin Cities Somali men, by discouraging local Somalis from cooperating with the FBI. CAIR-MN is thought to be closely aligned with mosques that may have recruited the local Somalis to take up arms overseas in jihads. CAIR's Minnesota branch branded two Minneapolis moderate Muslim activists as "anti-Muslim" for their participation in a seminar criticizing an Islamic terrorist group in Somalia. The terrorist group, Al-Shabaab, is an al-Qaida affiliate. Also, see here.